katycrossen.com: Does Danny Ocean Need A Campaign Manager? 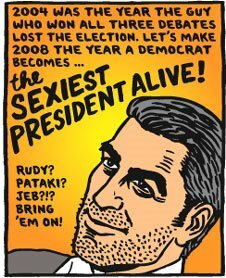 There is a push to get George Clooney to run for president in 2008. This article from the San Francisco Chronicle sheds a little more light on the interesting possibility. I'd be happy to help out the ol' Kentucky boy. I did a whole thing once about how Christopher Walken should be the Prez since he already made Secretary of Commerce in Wedding Crashers. Would George likely go with Brad as his running mate or would he skew older and go with Carl Reiner to get the AARP vote? Matt Damon for an asskicking Secretary of State (especially after his fine work as Jason Bourne) and Bernie Mac for the hippest Secretary of the Interior ever.